MAGIC Association holds a Extravagant annual award ceremony called MAGIC Association Achievement Award Ceremony. 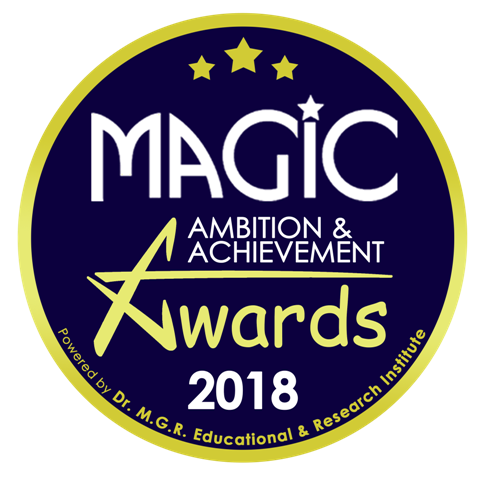 MAGIC Association Achievement Award has been designed to recognize, encourage and reward the student's outstanding achievement and contribution's. "Make the most of yourself by fanning the tiny, inner sparks of possibility into flames of achievement"
It is recorded that MGR Association Day 2016 was executed successfully with 405 award recipients. The MAGIC Association was formed with the aim to unify all the Departmental Associations under one roof and perform various activities focusing in the development of students and staffs, self-realization and managerial skills. The students and departments qualifying to the categories should nominate themselves with the required documents for the awards based on self- nomination. This award is for the students who have participated in recognized International events. This award is for the students who have participated and won prizes in recognized National events. This award is for the student who have participated, Organized or involved in the number of social welfare activities. This award for the students who have attended number of Internship, Certification Courses, Diploma Degree, Swayam, MOOC, NPTEL Courses, etc. This award is for the students who actively participated in events & activities. Award encompasses three categories internal, external & overall participation. This award is for their Research, Publication, Patents, Projects, etc. This award is for the maximum amount of sponsorship collected throughout the year for Department events. The best CR will be awarded based on the overall performance in execution of regular classes. This award is for the students who organized maximum number of activities. This award is for the student's overall performance in academic excellence and co-curricular activities. This award is based on polling by the students for their favorite teacher. This award is based on polling by the teachers for their favorite student. Interested and eligible members, submit your nomination forms with the necessary supporting documents to Dean EPA Office, Anna Block 301, Maduravoyal E&T Campus on or before 20th March 2019.